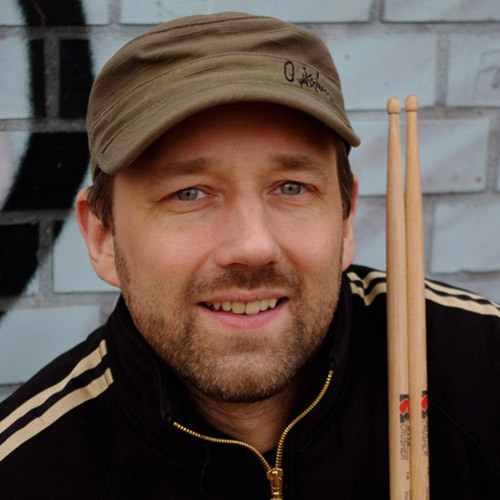 Mirko Schmitt started playing drums when he was six. He studied styles such as studio and contemporary drumming, jazz, Brazilian and Afro-Cuban rhythms and big band drumming at the Percussion Institute (P.I.T.) in Los Angeles, where he was taught by pros like Joe Porcaro, Ralph Humphrey (Zappa, Manhattan Transfer, Al Jarreau), Casey Scheurell and Efraine Torro. Mirko Schmitt graduated with honors and won the “Best Commercial Drummer Award”. Abrew of Los Papines. This made it possible for him to deepen his understanding of Latin American rhythms for drums and percussion. Mirko has worked successfully in London and Berlin, both in the studio and while touring with bands such as Imagination, Snap and The Prodigy. He was also the music director for U.S. hip hop queen M.C. Lyte, and played at the Arena in Berlin on her European tour. He’s had a variety of TV appearances on MTV, Top of the Pops and the BBC. Mirko currently works as a drummer for Mike Richards (folk/rock/blues/indie), Pax Nicholas (afrobeat, afro soul, afro funk) and the Bolshoi Bandits (ska/polka).